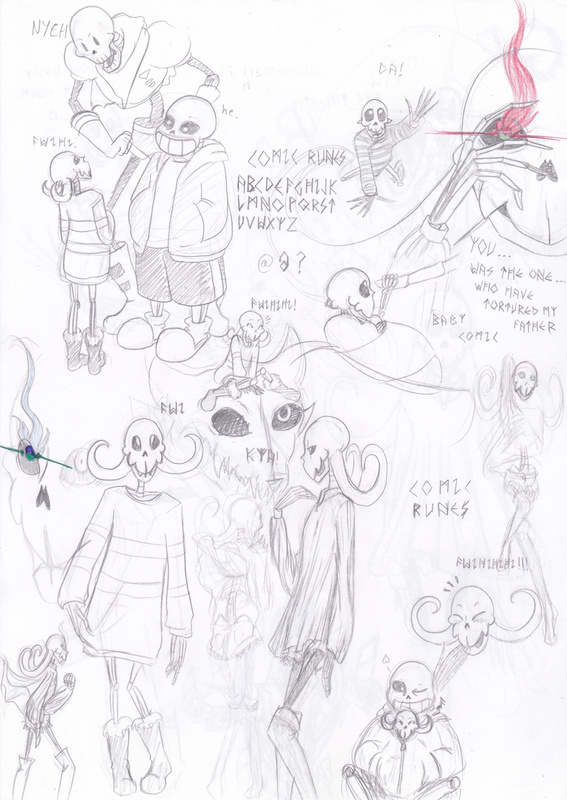 Tall, but not as much as Papyrus, Runes certainly don't inherit her stature of Sans. She have horns on the back of her head, but they are flexible. She can also moove them a little... More when she have strong emotions. Protective, Runes love her "Daddy", she work hard to protect her Daddy from all harm. He's so fragile! She have Gaster Blasters... But they can't blast anything, they are much portals than anything else. Her family come first, but she's still friendly. Buuuuut if you hurt a member of her family... even by accident... She will never forgive you and will harass you. If the hurt is not very bad, she will just harass you with bad jokes... At very bad times. If more than that... You will have so much of a bad time! Likes: Her family, jokes, the Gaster Blasters, napping with her daddy. Dislikes: Cruelty, Strings (who just invent this nightmare?! ), Snails. Underfell... Post out of this hell! My OC of Undertale: Comic Runes. She's Sans daughter (Comic indeed), but we don't know who's the mother. Like Papyrus she have a very specific laugh, with her weird teeth, she can't really close her mandible, so she make a "Fuy" sound when she laugh.